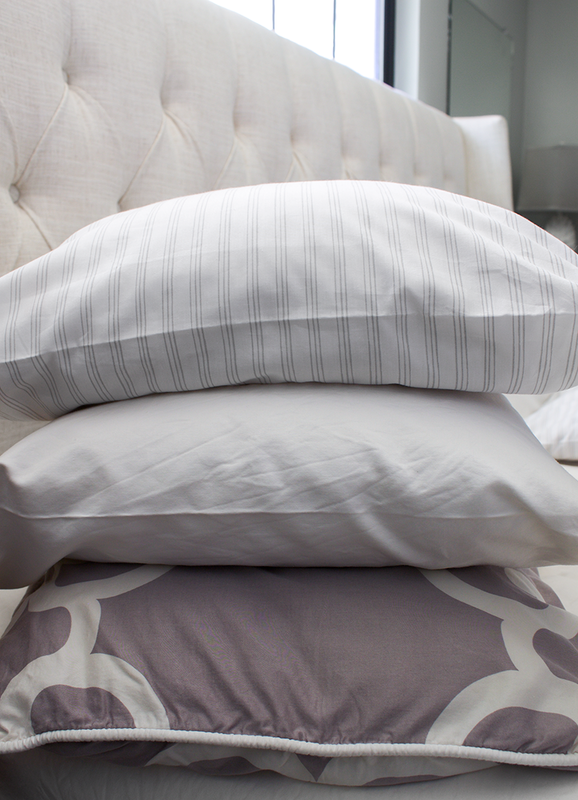 Fall is almost here and I figured it was time for a little bedding refresh. 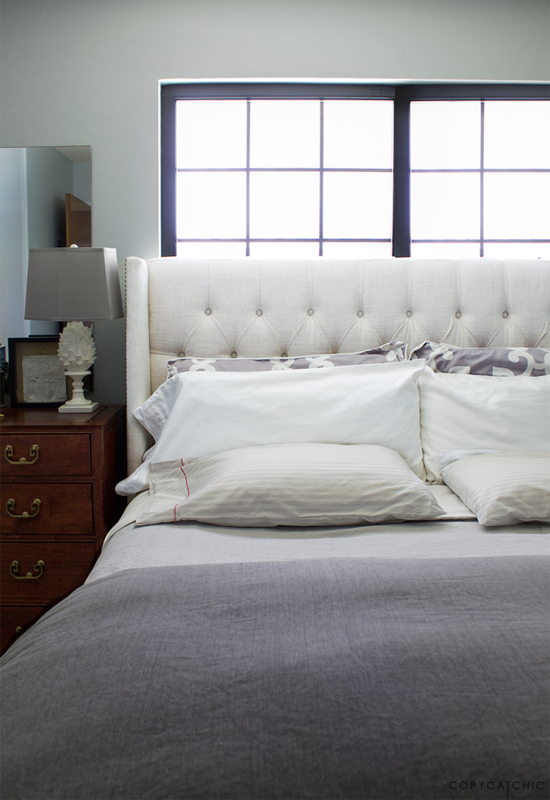 It’s an easy and inexpensive way to make your bedroom feel like new. I also like to mix and match bedding to give the bed a layered, more personalized look. Luckily for the Mr., I tend to prefer neutral and dark colors and masculine patterns and fabrics. 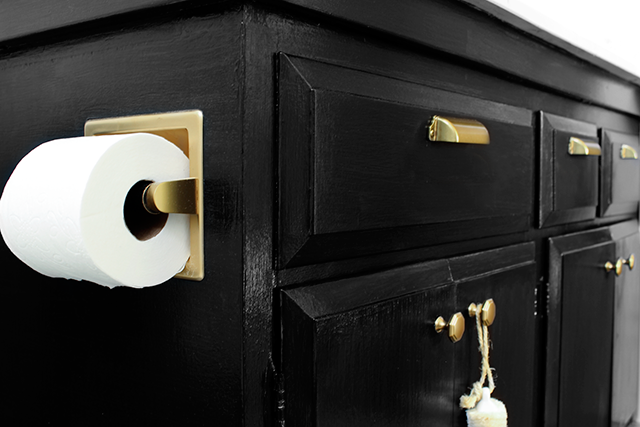 When I saw Target’s new Brooklyn & Bond collection, I knew we’d both love the different mix-and-match options. 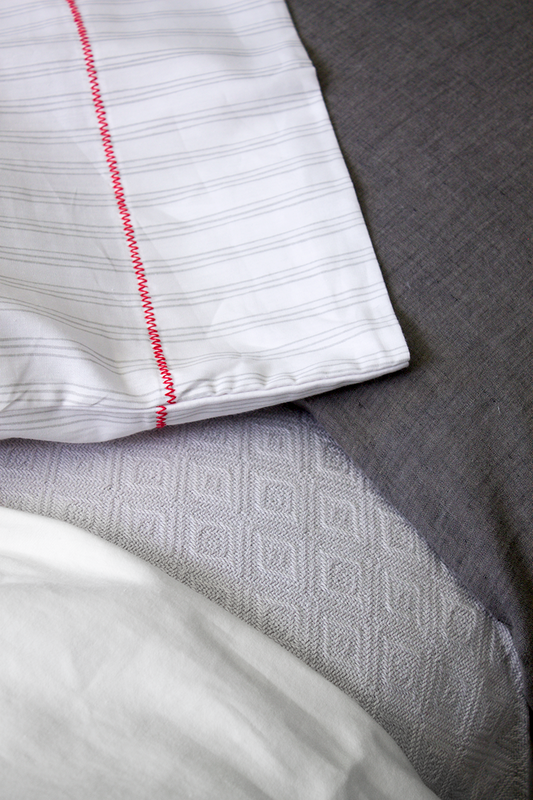 Our master bedroom is decorated in different grays from light to charcoal, so the Brooklyn & Bond gray color really spoke to both me and the Mr.
First we chose some new pillowcases with gray stripes and contrasting red stitching. I’m always a sucker for stripes and luckily the Mr indulges me 😉 The red zigzag stitching detail adds a little touch of the unexpected, don’t you think? We opted for just the pillowcases to pair with a solid sheet, which gives it a more eclectic look. The sheet set is also available and I was so close to getting it instead! 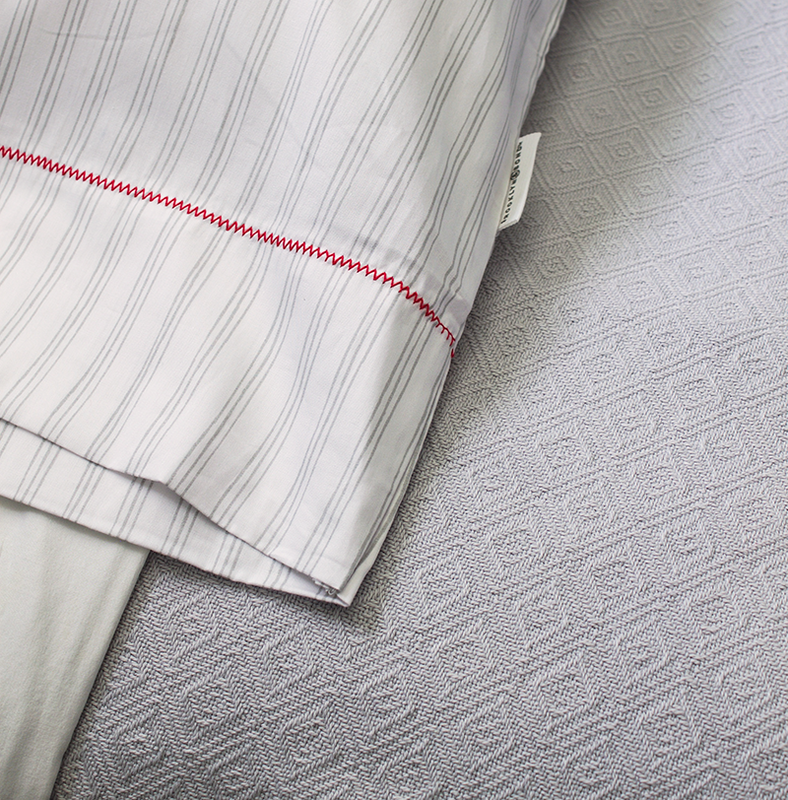 This diamond pattern 100% cotton blanket is a great bedding staple. 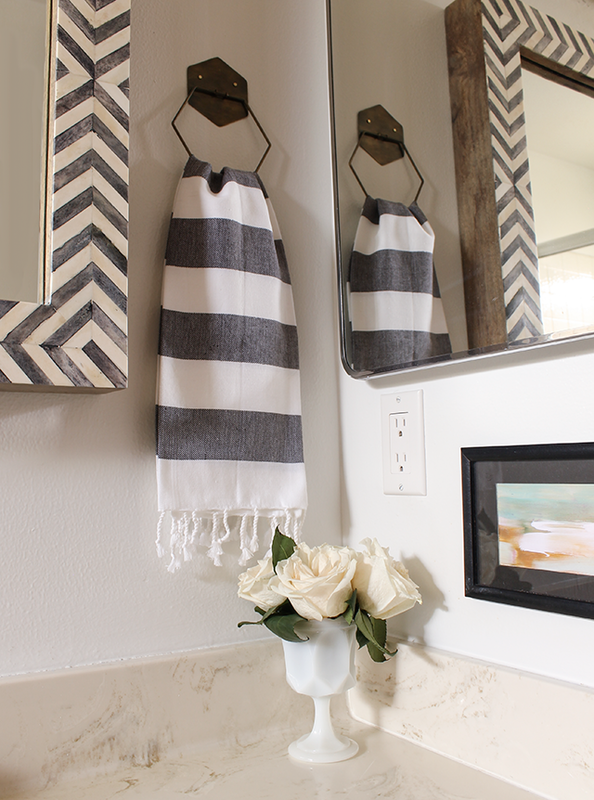 It’s great for having on hot summer nights or layering in the colder winter months. I have an addiction to blankets, I always love a good blanket with character – this fit the bill! 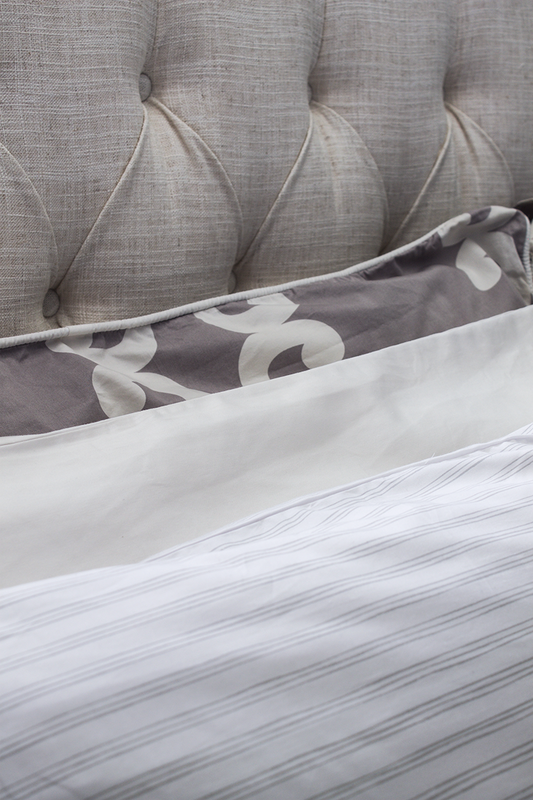 Our new Brooklyn & Bond bedding really fits right, doesn’t it? I love how all of the different tones of gray tie everything together. Here are some more Brooklyn & Bond items you might like! Thank you for supporting Copy Cat Chic and our generous sponsors! It’s Monday today and I have a fun giveaway for you all 🙂 Today’s giveaway is hosted by a company I’ve worked with a few times already and it’s always been a pleasure. 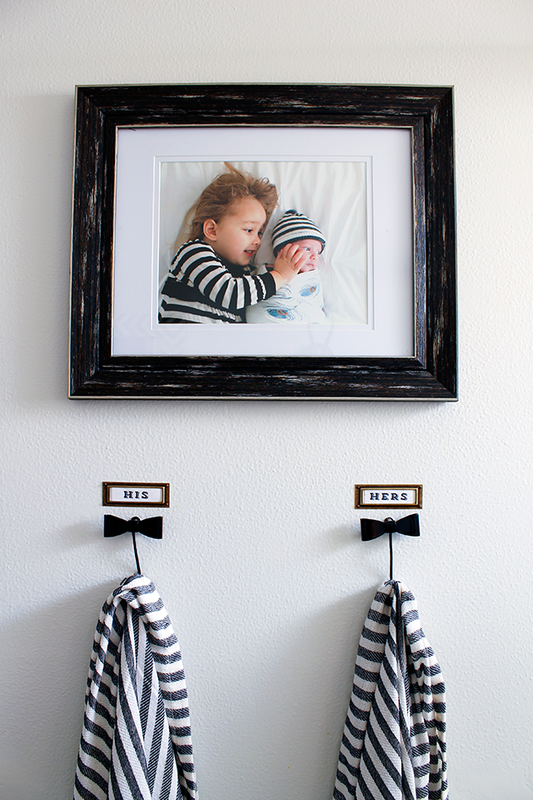 You’ve probably heard of Minted from their amazing invitations, holiday cards and business cards, but they have an amazing and unique line of art prints from a crew of really talented artists. 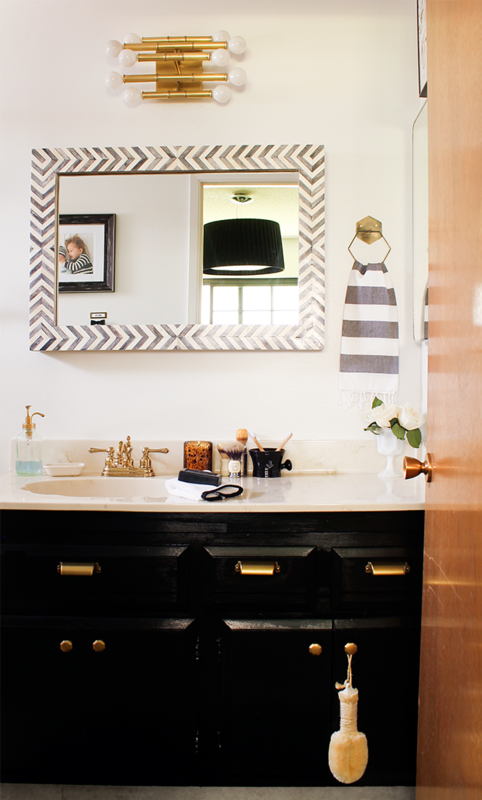 I’ve used their prints a lot in client work and room redos and I even used some in my One Room Challenge bathroom makeover. 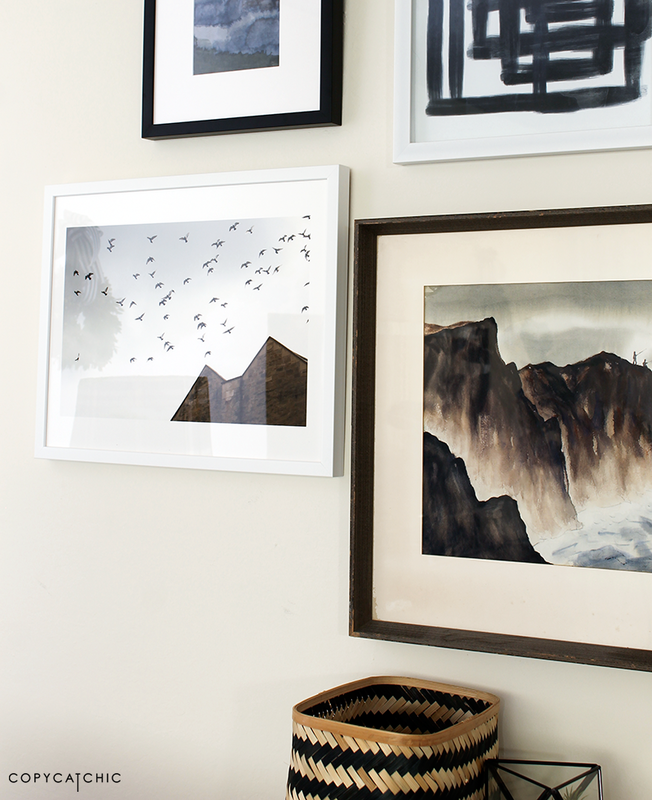 Minted makes it so easy to find unique art with the different artists they partner with. I also love that they offer limited edition art, it definitely makes a piece more precious. I decided to go with these prints because they really complimented and accented the pieces we already had. Now for the fun part! 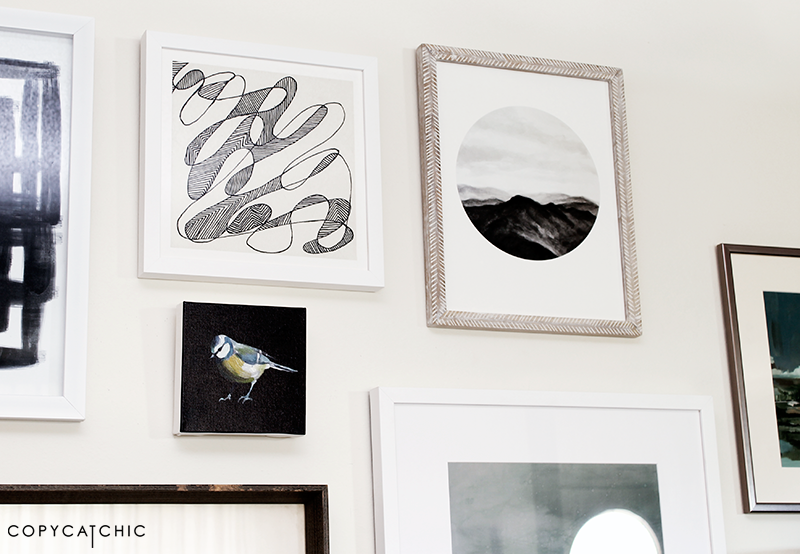 Would you like to win $500 to Minted for some artwork of your very own? A winner will be chosen on May 11th, 2015. Good luck! 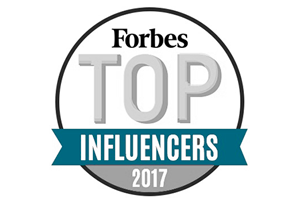 Thank you for supporting Copy Cat Chic and our generous sponsors. 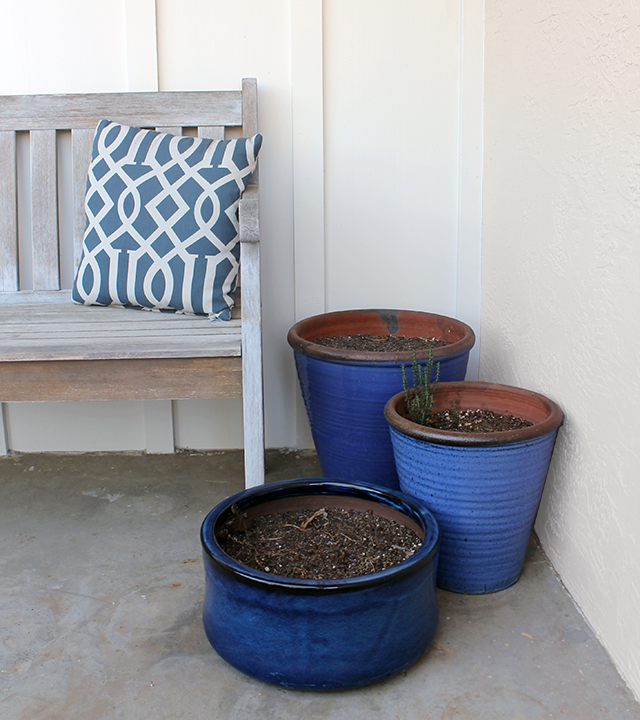 We have this lonely little corner on our front porch, where all of pots are sitting empty. Everything we planted last year never really grew. It’s pretty sad and has pretty much no curb appeal whatsoever. 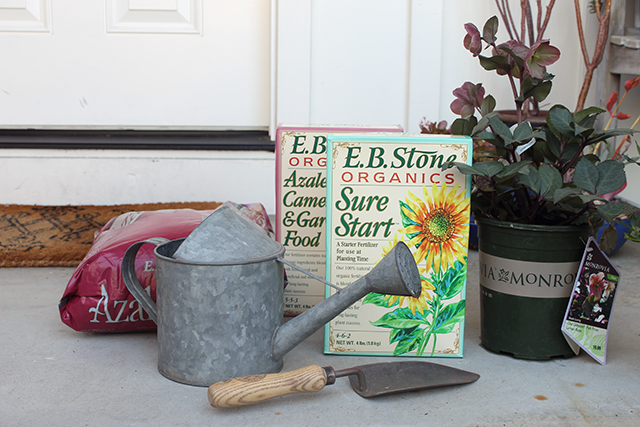 With spring around the corner, it was about time for a little attention, I had some free time this weekend to hit the nursery and find a few plants to bring home. I decided to partner with Monrovia to help me figure out what would actually grow there. It’s an awkward spot, because it’s shaded by an overhang most of the day. It gets good morning sun, but then is in shade most of the afternoon. 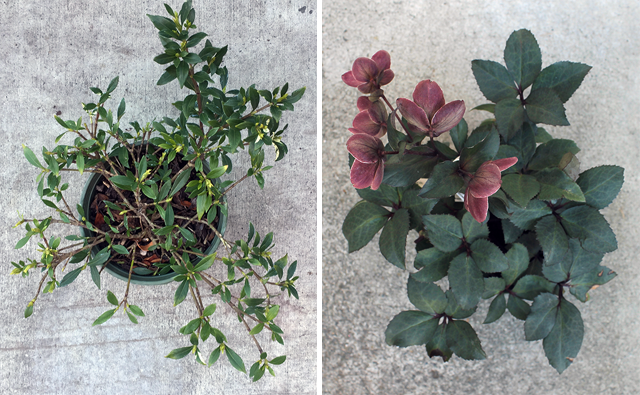 After roaming around my local nursery, I stumbled upon some gardenias in the shady shrub section. They are my favorite flowers. I just love their fragrant, creamy blooms. 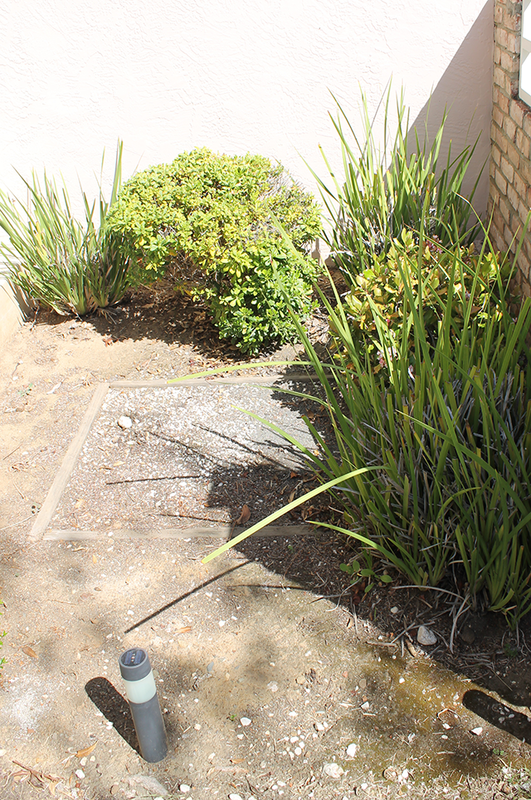 I’ve never actually grown gardenias and for some reason I thought they didn’t grow in this area? So when I saw them, I had to have them 🙂 And I was told they do really well with morning sun and afternoon! 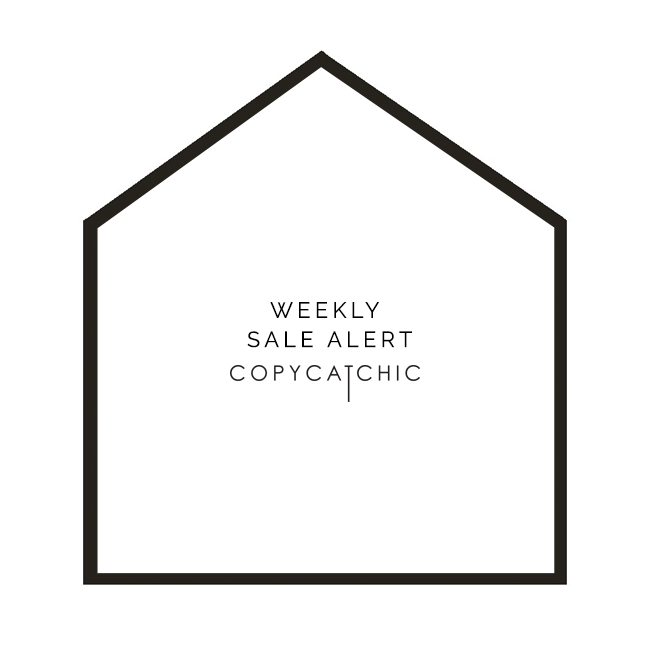 Thank you for supporting Copy Cat Chic and our generous sponsors that make this blog possible! We’ve been doing a lot of homeschooling with Arden lately, getting her ready for kindergarten (wow!). So I figured it was about time for her to have her own dedicated learning and workspace. 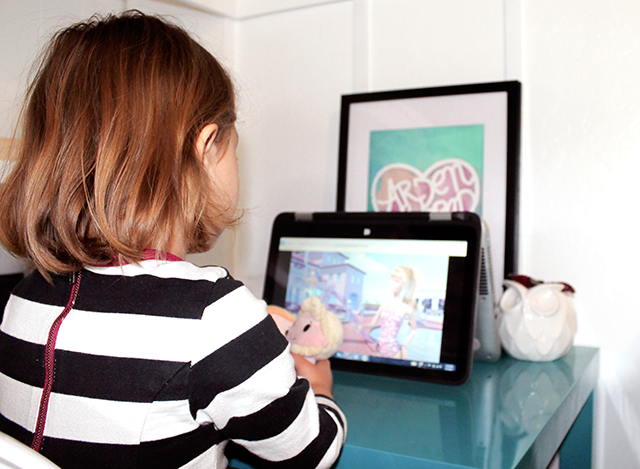 I’m partnering with HP x360 to talk about the four different looks we’re going for when creating Arden’s school area. It doesn’t have to be a huge space, as long as it’s functional. We decided to set her up in a cozy corner of the playroom. Eventually, I’d love to have the whole playroom be more of a school/play room, but we’ll take it one step at a time! 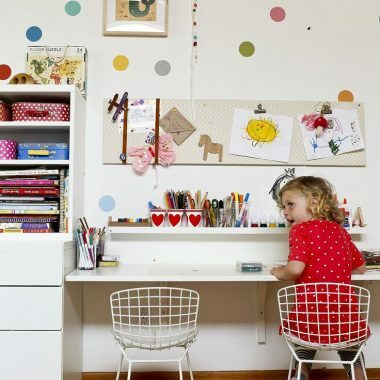 I love this little girl’s desk. Not only was it made to fit, it also has a sleek, modern-feel while also being functional with all of the storage space. That ledge over the desk is such a great idea to keep pencils handy. And since everything has its place, the desk looks clean and organized. 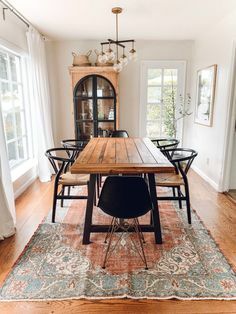 `Okay, how amazing is this dining room turned homeschool classroom? I’m so keeping this in mind for our playroom. The reason this space is so successful is because the unified color scheme. The teal accent color ties everything together and the warm tones of wood and the baskets keep it from looking to one-note. And you’re so busy admiring the fabulous shelving wall, that you’re totally distracted from the fact that it stores kid’s things. Pretty fabulous and functional right? This rooms calm demeanor gives off the organized but productive vibe. 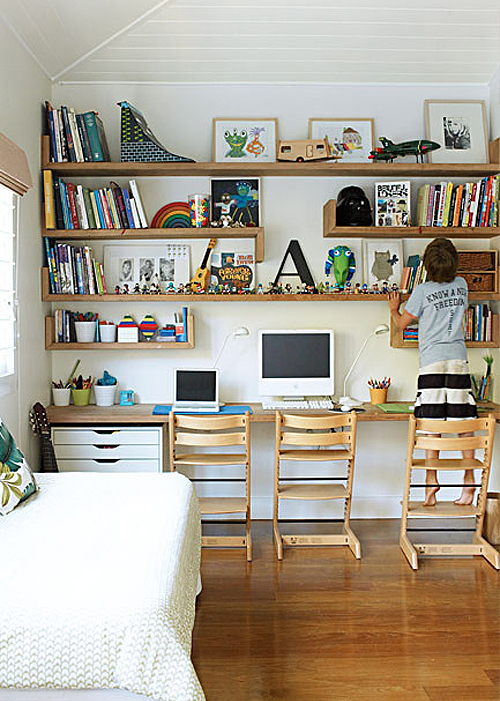 What kid wouldn’t be inspired to work in this beautiful room? 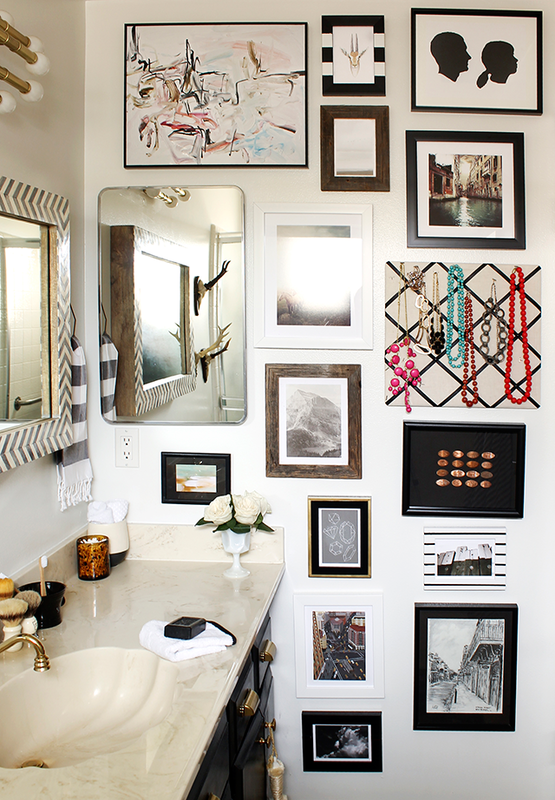 Can I just say…I want one of those peg board organizers for myself? Please? Last but not least, isn’t this computer display is so genius? The computers, wood shelving, books and toy collections all mesh in this great casual, fun and light-hearted way. 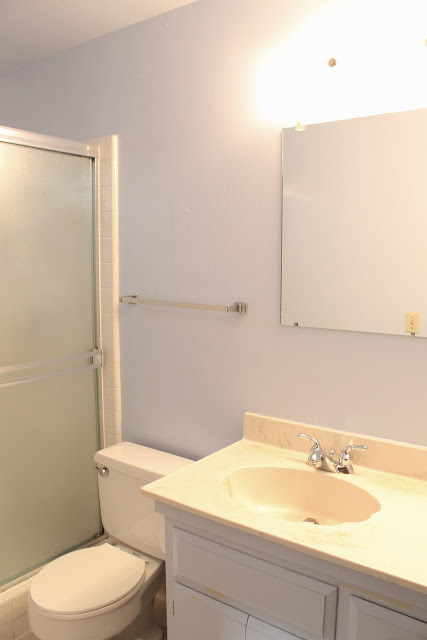 It gives off the effortlessly-chic vibe doesn’t it? I really love how the shelving and desk span the width of the room creating plenty of space for mutliple kids to work side-by-side. And any room with a Tripp Trapp is A-ok in my book. Now for our start. 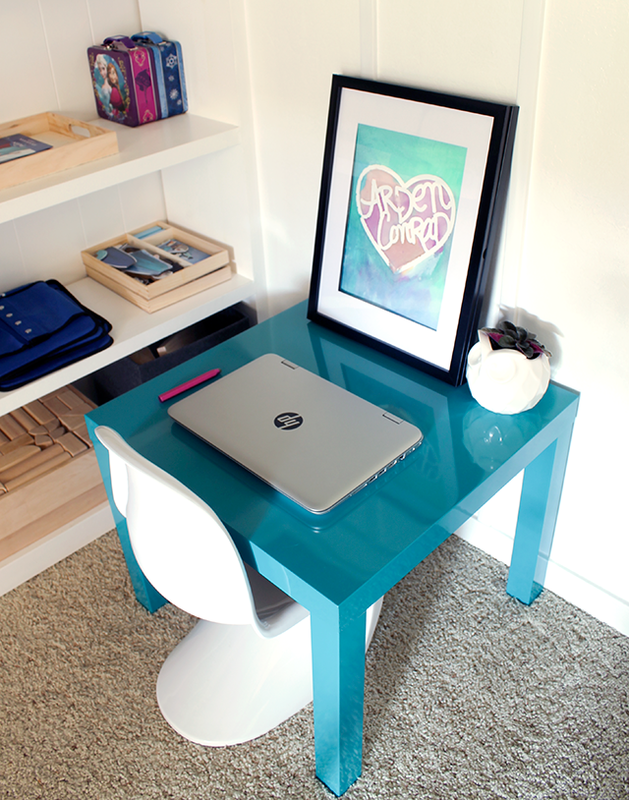 Here’s Arden’s new desk; an Ikea side table that I bought off of Craigslist for $8 (original is only $10 btw!). Isn’t it adorable? I think the teal color keeps it fun. 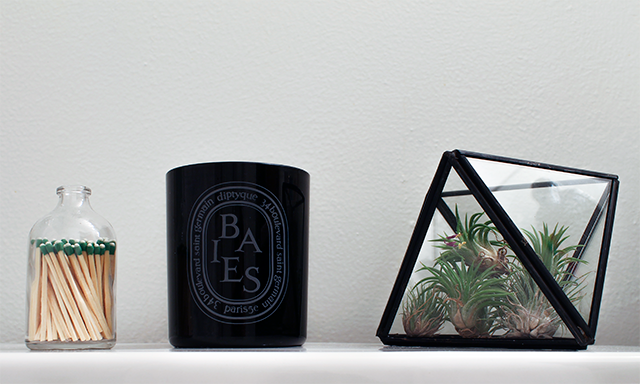 I added a little easy-to-care for plant in a cute little owl planter. 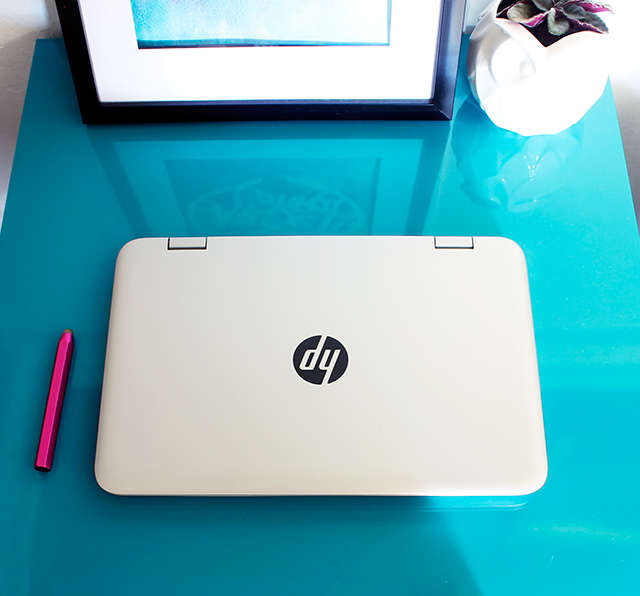 And for the Pièce de résistance, we partnered with HP to get Arden her very own laptop, one of their newest most versatile models, the x360. So why the x360? It’s a tablet and laptop in one and it has four different modes, laptop, tablet, tent, and stand. A mouse can be kind of confusing when you’re just learning how to use a computer. 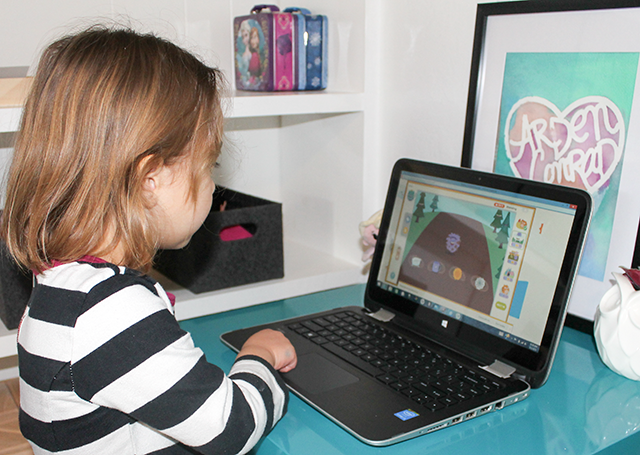 And since Arden is really comfortable using iPhones and iPads we thought the x360 would be perfect for her because you can either use it like a laptop…. Or use it like a tablet. 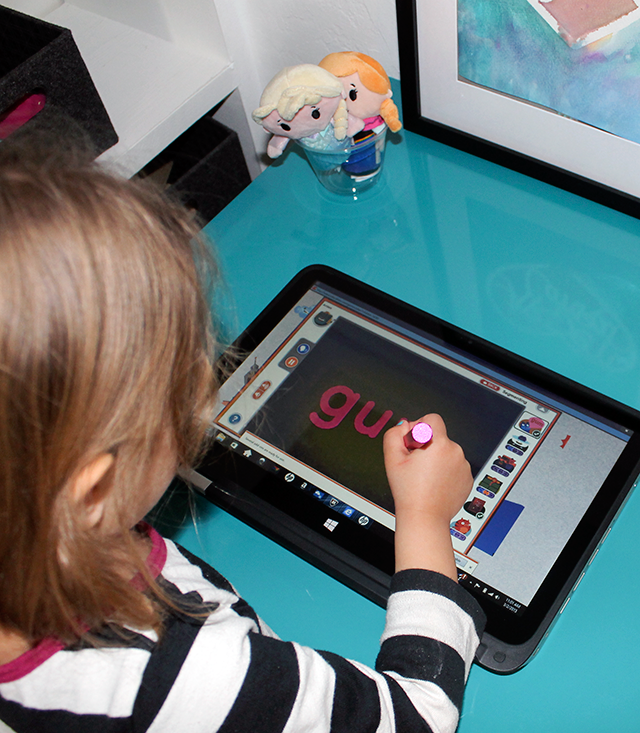 Here’s she’s using a stylus to practice her letters. Or she can watch her favorite shows on it. The screen is nice and big for being a tablet combo. It’s great that she can use her stylus to perfect her pencil grip or she can just use the touch screen to navigate. It makes it super easy for her. She’s loving her new computer and we love having such a versatile tablet around the house. 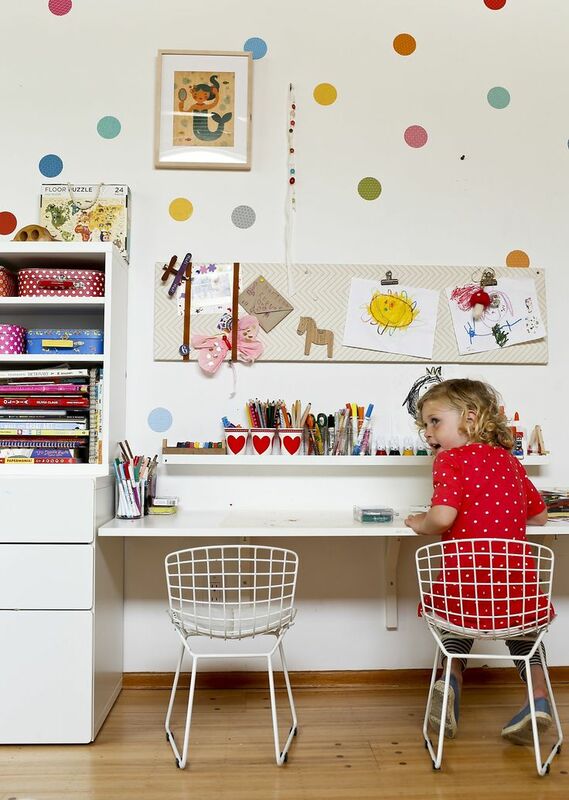 Do you have a special spot where your kids can learn, study or do their homework? 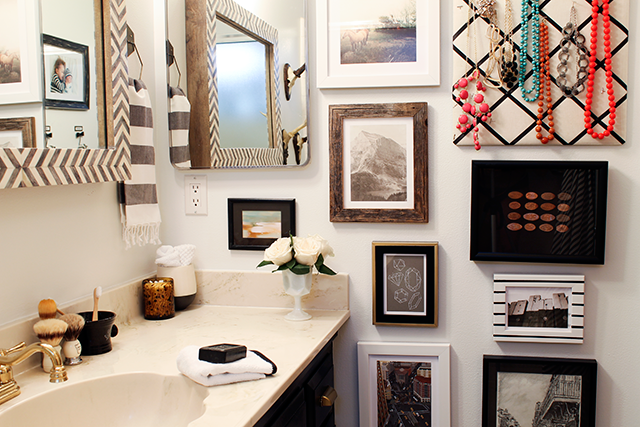 What does your space look like and what was important to you to have to make it functional? I would love to hear your thoughts! about the sponsors that help support Copy Cat Chic. March is here and we’re just that much closer to Springtime! I thought it was a good time to update the living room with a couple of new accessories to start getting ready for the new season. 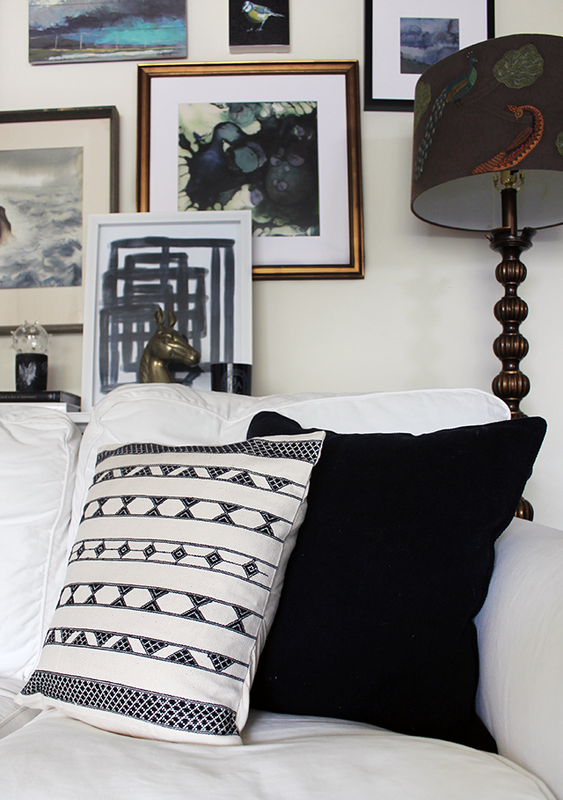 I had fur throw pillows, heavy throws and sheepskin all over the place, to make the space cozy for winter. Now it’s time to switch gears and lighten up a bit. 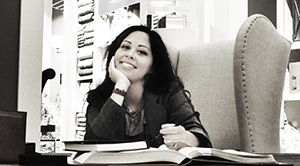 I was recently contacted by Novica because they were interested in hosting the next giveaway. I was really happy to learn more about their site and their cause. If you haven’t heard of them before, they’re a great resource that offers a huge array of internationally made products from places like India, Africa, Central America and Asia (to name a just a few) and helps support global artisans. The products are unique and well-made AND another plus? You can read the story of the actual person who created the item you’re buying. Such a cool idea and the products are a great price too. It feels so good to endorse a company that’s employs such good business practices; it’s definitely a win-win, wouldn’t you agree? I wanted to choose a few items from the site for my own home to review for you guys. So I chose these graphic, woven pillow covers to switch out my fur ones. 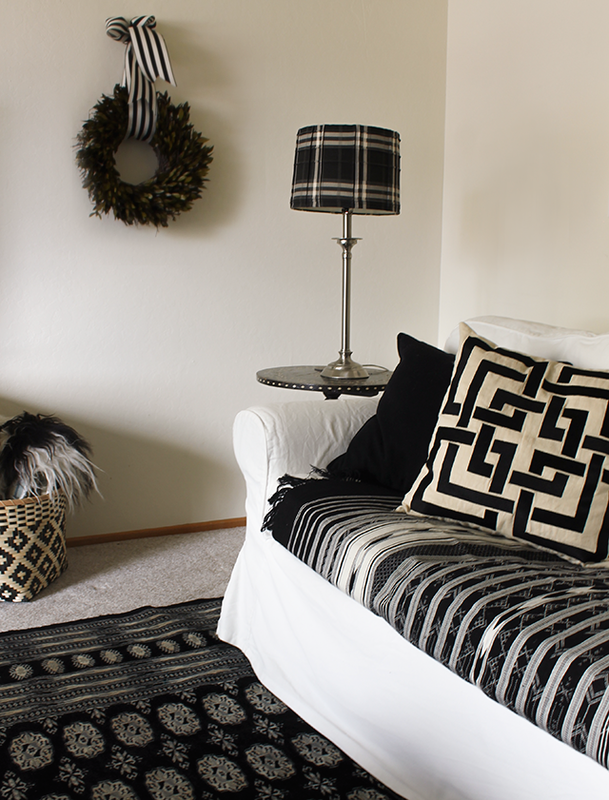 The pattern adds a fun element and the black and white color scheme ties it in with everything else in the room. The covers are made from wool and nicely made with thick fabric and an easy to use envelope opening. The next item I chose was this amazing throw! It’s made from cotton and hand-woven in India. The pattern definitely ties in with my new pillow covers without being too matchy-matchy 😉 It makes a perfect couch cover btw – so nice to have when one has two little ones and a white sofa! ha. It’s definitely not your Grandma’s sofa cover, that’s for sure! On another note, do you think I’m slightly addicted to pattern? Maybe…. 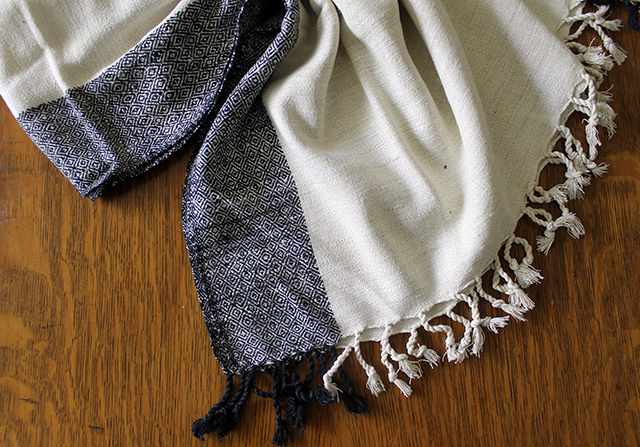 The last product I chose was this luxe, raw-silk scarf in black and white (of course!). 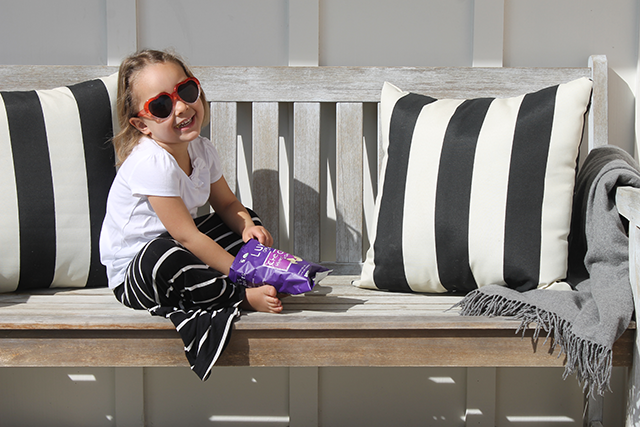 It’s more lightweight than a winter wool scarf, so perfect for the unpredictable springtime season. It’s also not as light and filmy as a traditional silk scarf = all-in-all, the perfect Spring accessory! I love it already. It had me at that diamond-woven patterned edge. Have you ordered from Novica before? What did you get? 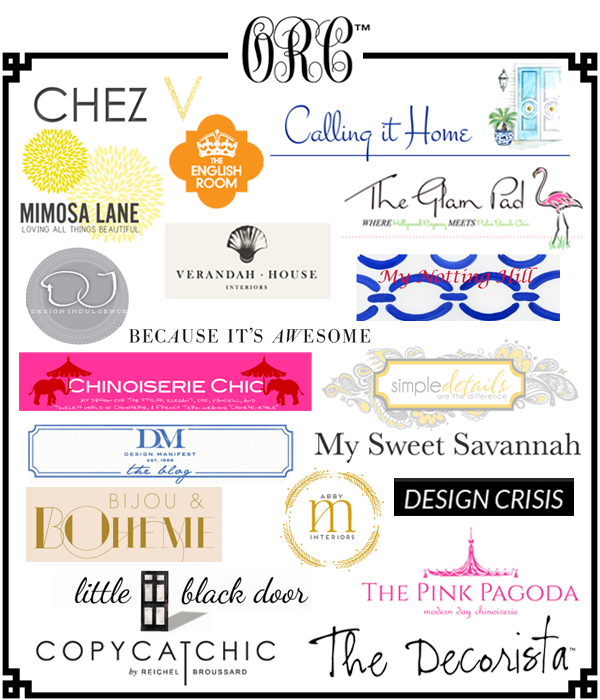 Thank you for supporting Copy Cat Chic and the sponsors that help make this blog possible! We’ve had this sandbox for Arden for a little while and we’ve finally set it up. I love this sandbox for a few reasons. One: I love that it’s made from wood. 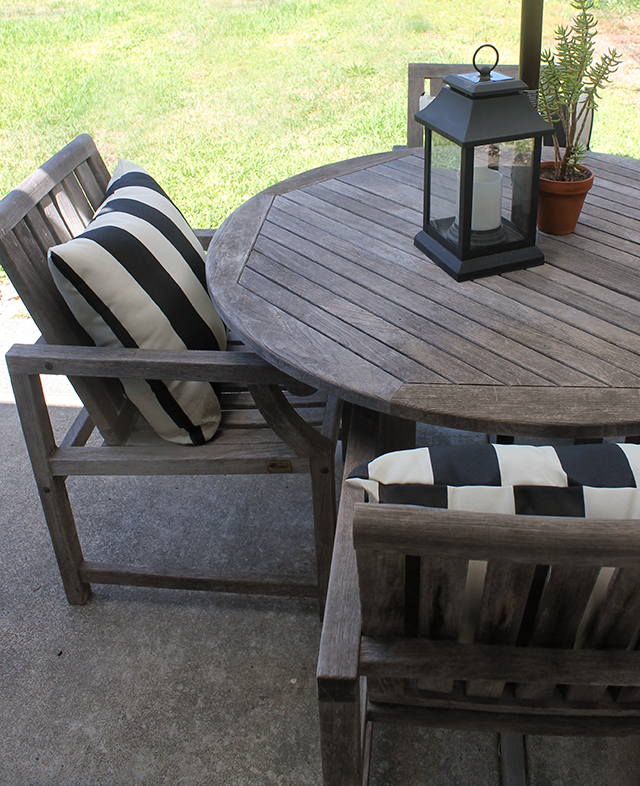 The finish on our’s is different than pictured below, it actually matches our patio furniture almost perfectly. Second, the cover folds up and makes benches on the side for the kids to sit on. 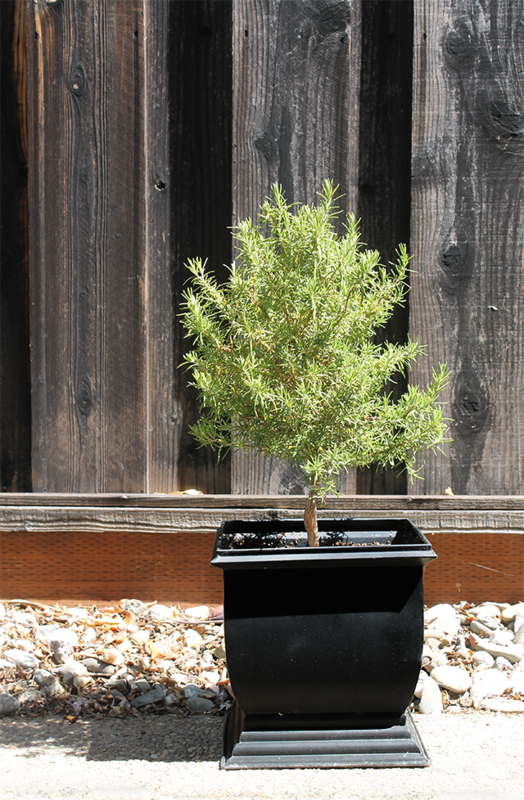 And last but not least, it has a great shade canopy to block direct sun. Once we set it up we filled it with this play sand and figured we were good to go. 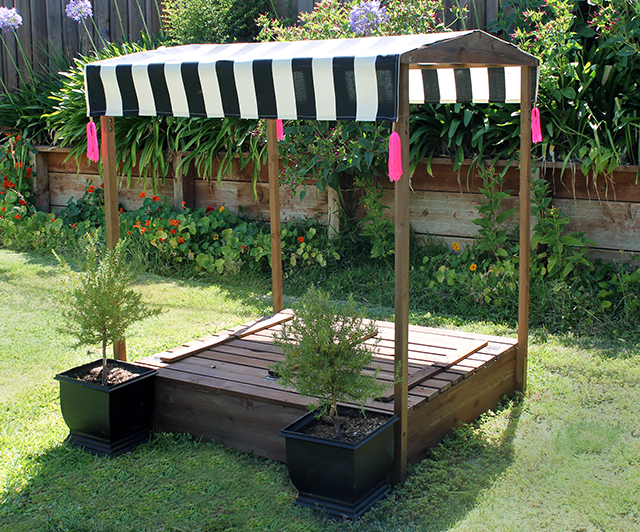 Then I realized that the canopy just wasn’t tying in with the rest of the yard. So I decided to create my own canopy and add a personal touch or two 🙂 I’d been eyeing this rope for awhile, knowing I had to use it in a project, but not knowing exactly what yet. I figured now was the time! 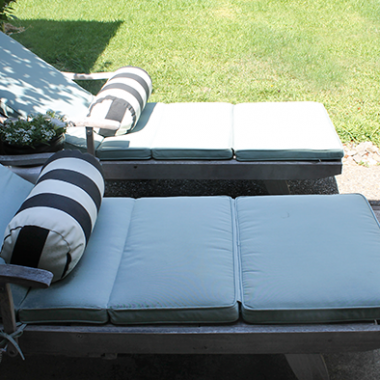 Then I bought this great black and white outdoor fabric for less than $9/yard and it matches my bolsters and pillows perfectly. I quickly cut it down to size and added straight double-folded hems on each side. The original canopy was attached using velcro, so I found this easy self-adhesive velcro from Lowe’s and used that. 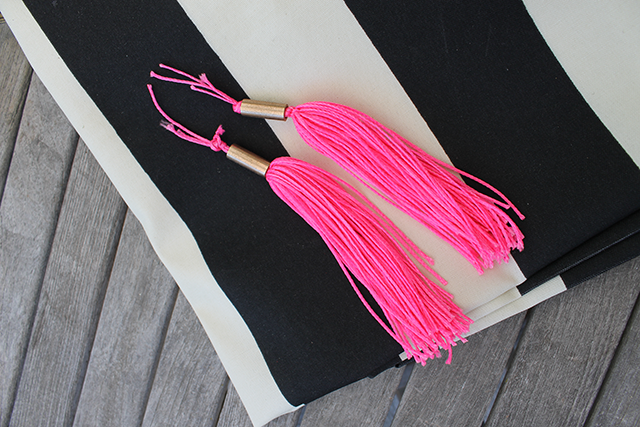 I used Kristin’s tutorial on making tassels. 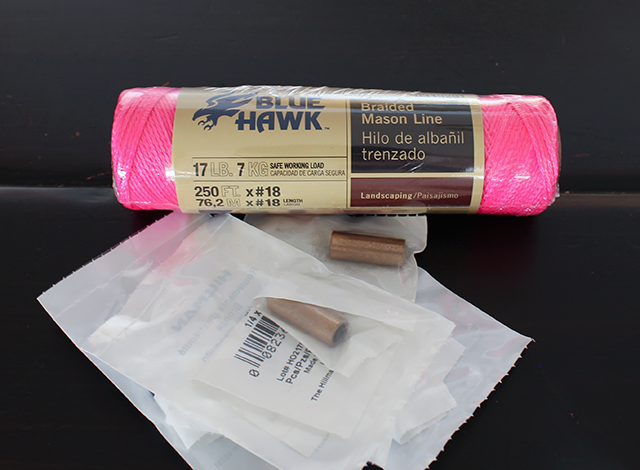 Instead of wooden beads, I found these: bronze sleeve bearings – they were perfect! Arden loves her “princes” sandbox now (That’s what she calls it). I love how the canopy ties it in with the rest of the decor and the pink tassels add enough whimsy to make any little girl happy! 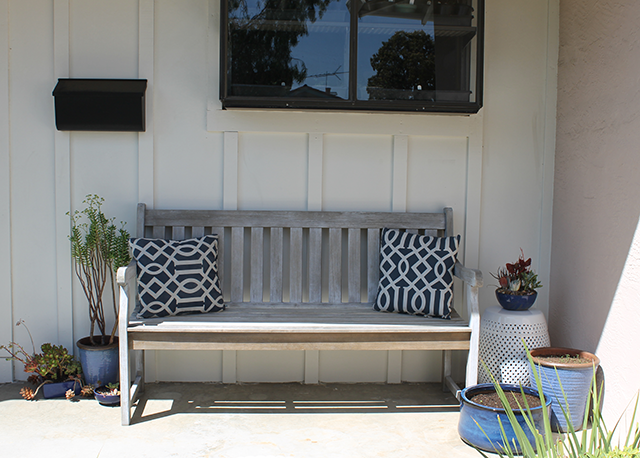 This post was brought to you by the Lowe’s Creative Ideas Network, which I’m so happy to be a part of along with a crew of other really creative bloggers, you can check out all of our fun projects on the Lowe’s Creative Ideas Blog. 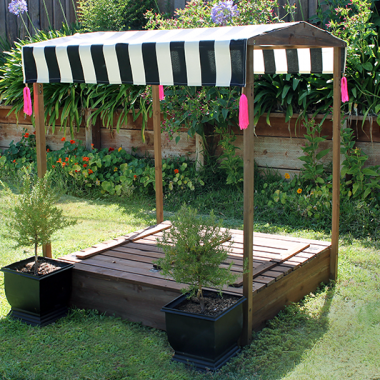 As a part of the LCI Network, I’ve received compensation in the form of Lowe’s credit to help with my projects below. 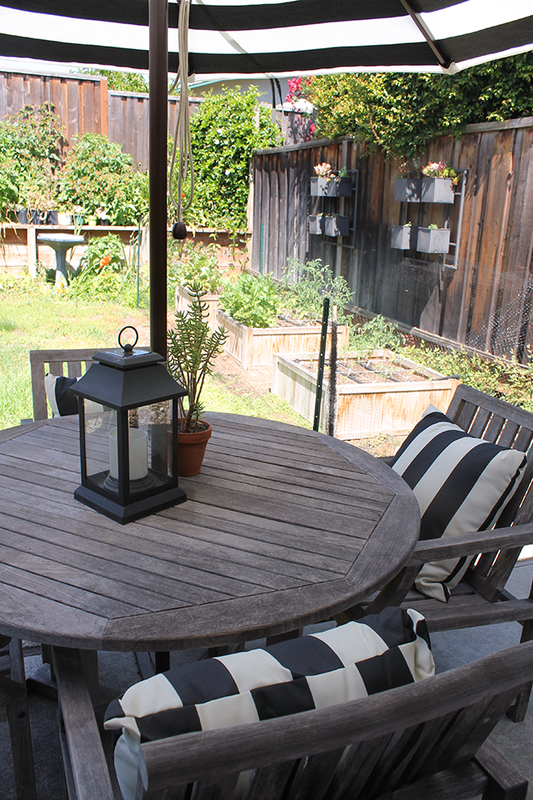 After seeing the backyard outfitted with all of the great accessories (mostly borrowed) for the fun outdoor party we had a couple of weeks ago, I figured it was time to outfit the yard for reals. We had a great base set up with the furniture we’ve owned for years, so we added some new accessories for the new season. 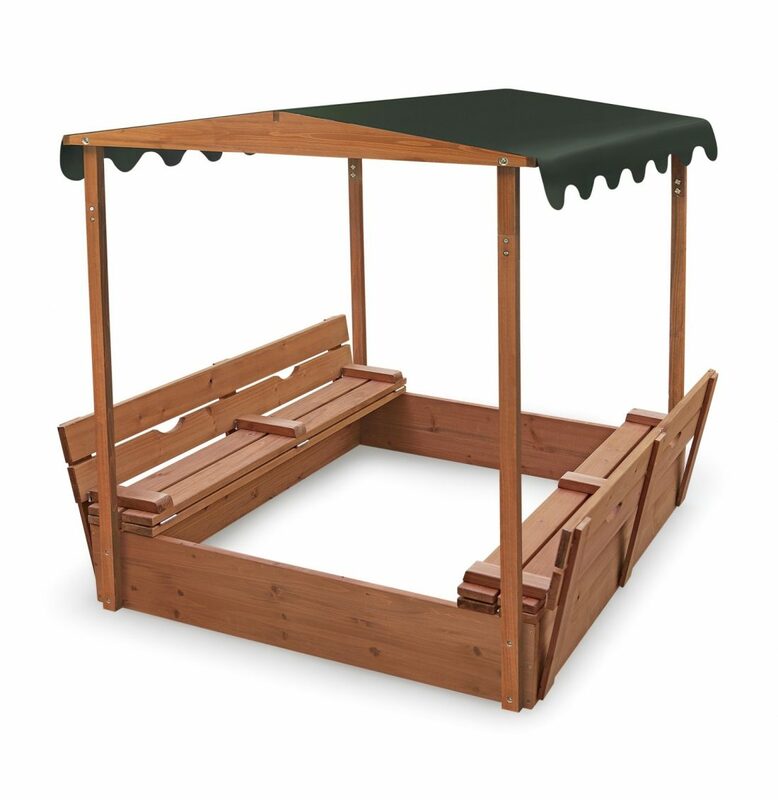 We already owned the table, umbrella, chaise lounges and chaise pads. So I added a top layer of accessories to compliment them. 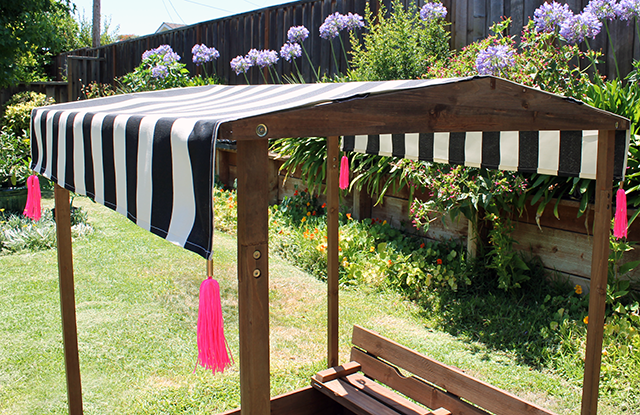 Since the umbrella we already owned is black and white striped, I decided to go with that theme across the board. 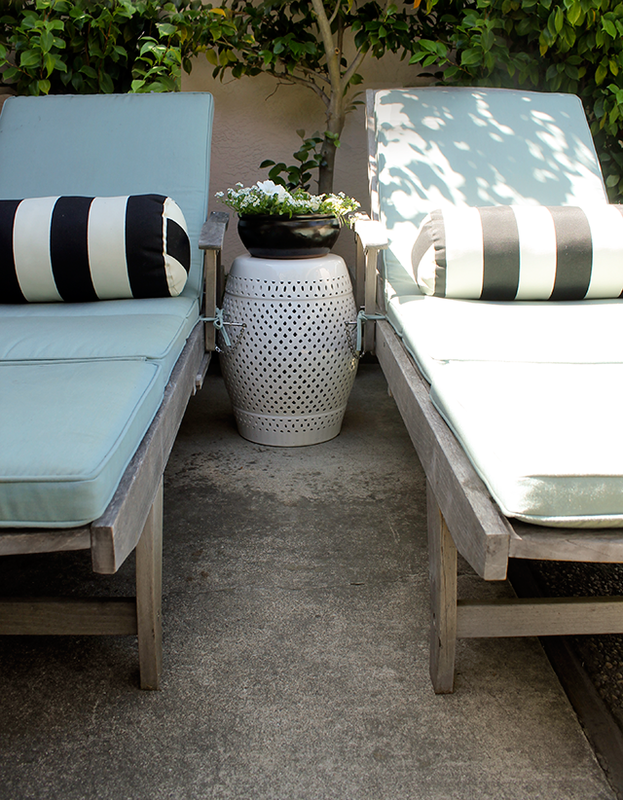 We started off with these two black and white striped bolsters for the chaises. They’re super comfy. I always end up using them as neck pillows when I lay down. 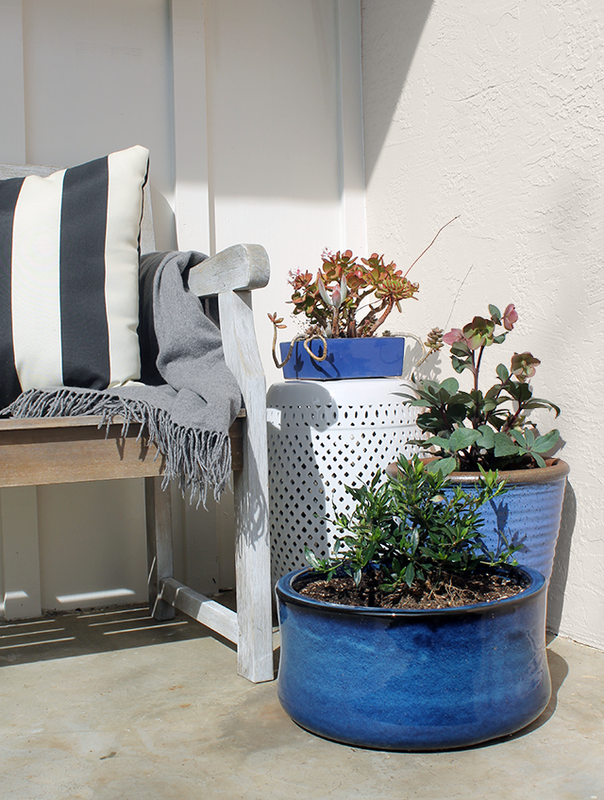 I added another ceramic stool in between the two chaises to make room for some pretty blooms. 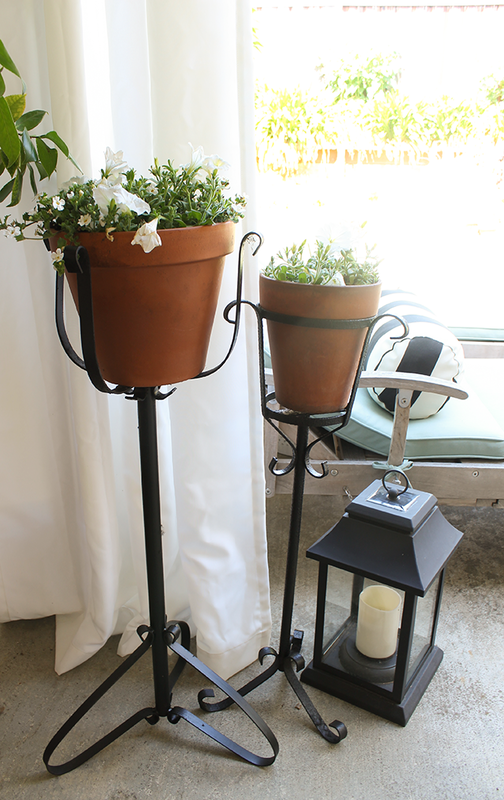 We inherited these two plant stands with the house when we moved in. They were pretty rusty, so I cleaned them first with some clr rust remover and then freshened them up with some black spray paint. Much better. 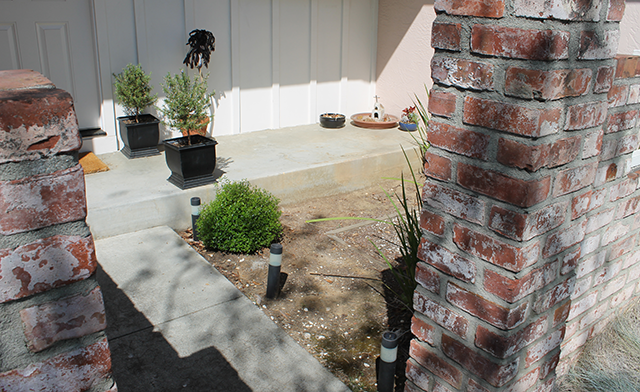 I added some new white perennials all around the yard in new clay pots to add some softness to the hardscape in the yard. The lanterns were a great sale find at the end of the season last year at Lowe’s. What makes them awesome is that the candles are solar powered. The little panel at the top, under the handle is actually a solar charging panel. Very cool right? They work pretty well too! 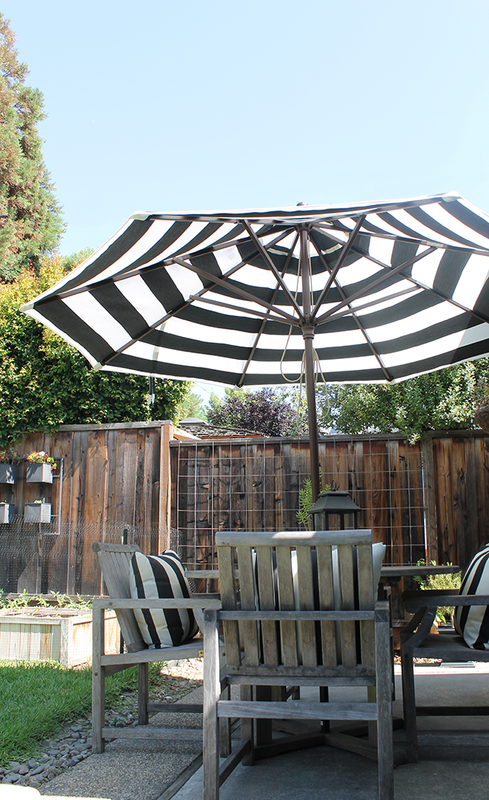 To outfit the outdoor dining area I bought four of these black and white striped pillows that match the chaise bolsters and the outdoor umbrella. 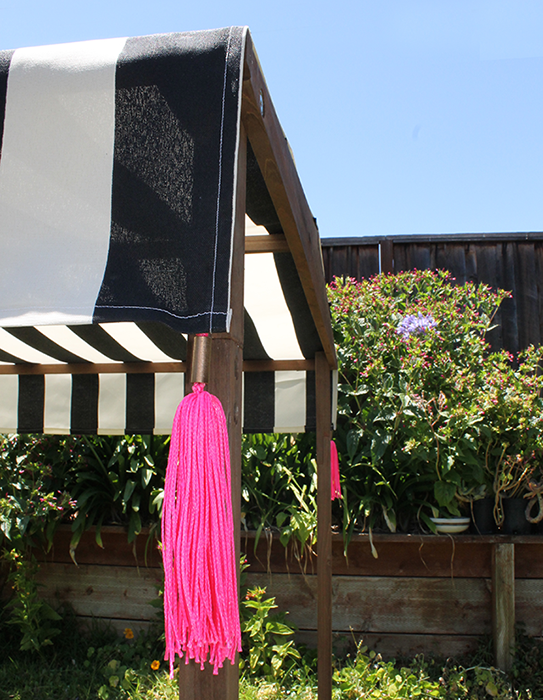 As you all know, black and white stripes are my addiction these days, so I figured I’d carry out the them in the backyard too. 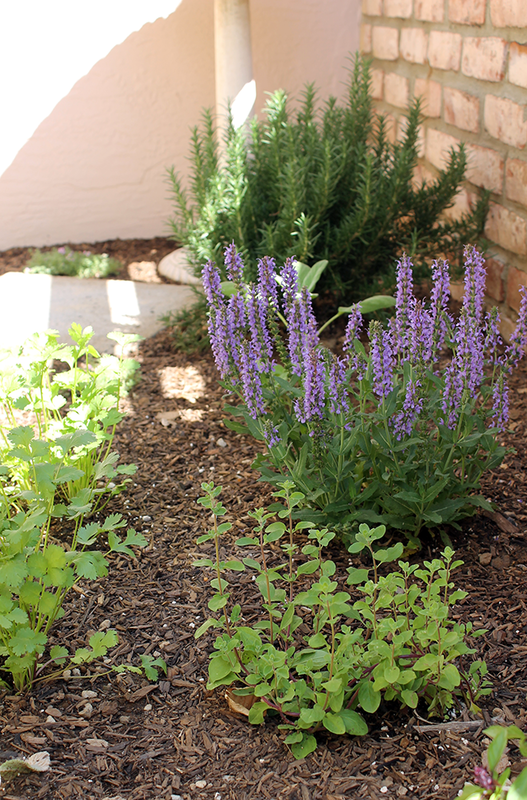 What’s your favorite way to update your yard for Summer? Hello my fellow One Room Challenge lovers! Can you believe it? The final reveal is here. Wow, what a fun ride that was! 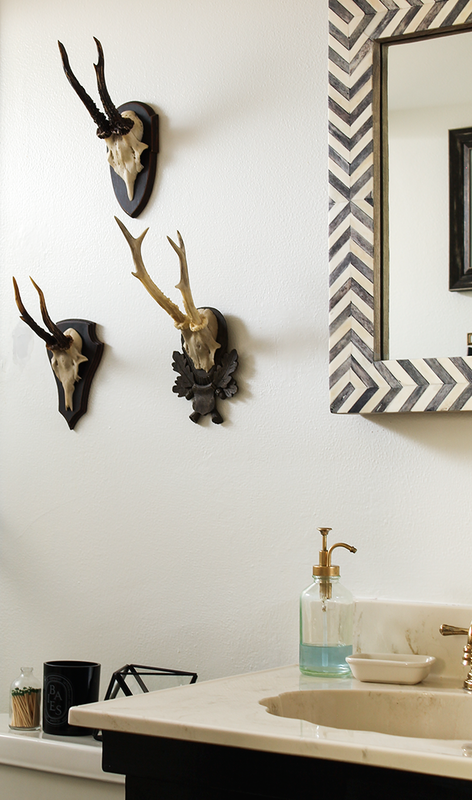 Thanks for following along on my little bathroom rehab, I’ve been loving all of your comments and advice. And there’s nothing like the One Room Challenge to light a fire under your bum to get things done. 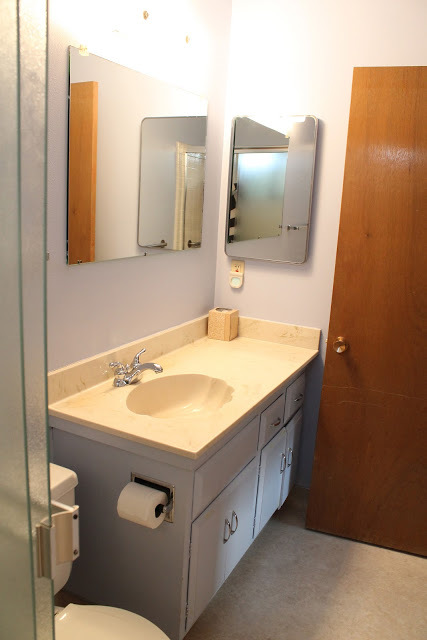 I’m soooo happy with the way my master bathroom turned out. It was such a lost little room there for a bit. It might not be to everyone’s taste, but now it’s so “me” I can’t even describe how much I adore it. 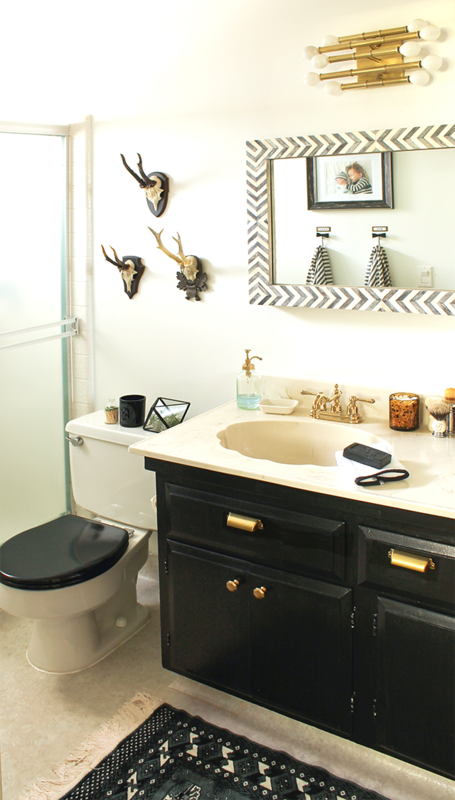 I’d have to say I’m pretty proud of my little rental makeover, especially the price! 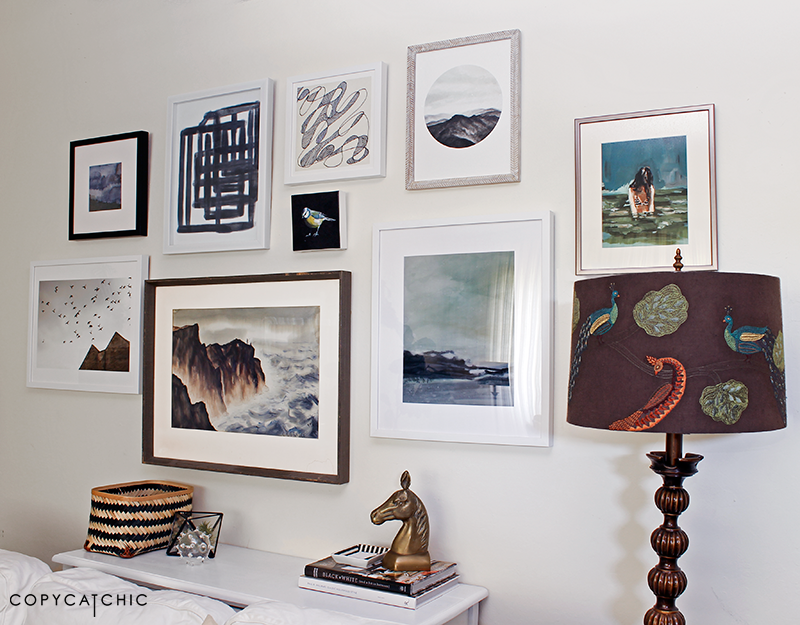 I created a gallery wall with all of the Minted prints as well as my jewelry board and some vintage pieces. Added some new caulk around the toilet. It really, really needed it. Also I kept the vintage rug because the other option isn’t available yet (have to wait until the 11th)! This shot of Arden and Conrad has center stage. Love it. 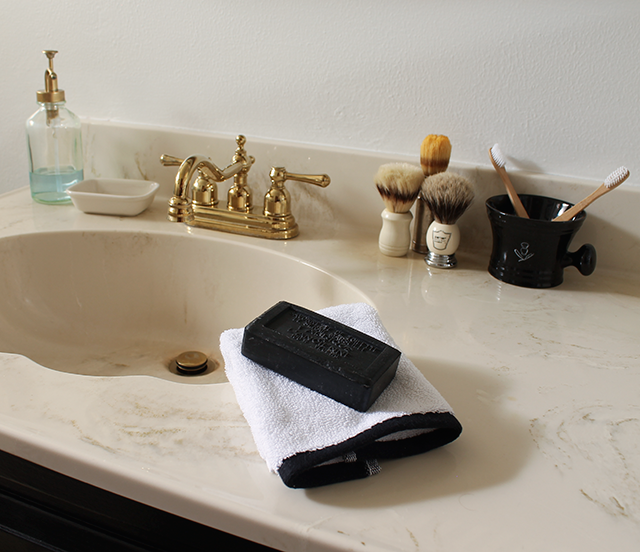 The new toothbrushes and the Mr’s shaving gear. 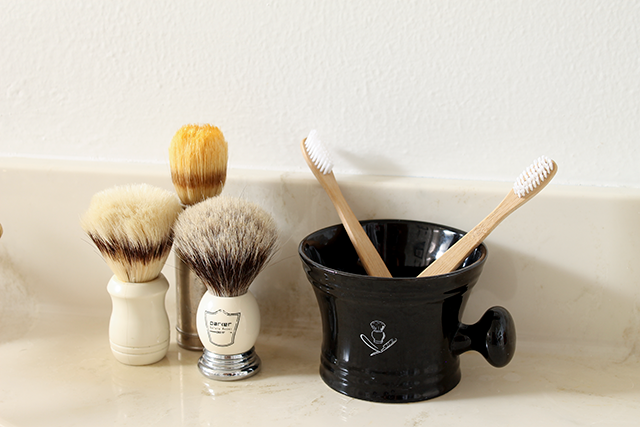 He has a great collection of shaving brushes. The two on the left are actually from his Grandfather. Another shot of the gallery wall – as you can see it spans the whole wall. And because it’s fun, here are some befores! Don’t forget to check out all of the amazing transformations that have taken place these last six weeks! I still feel so blessed to be a part of such a talented group of designers! Happy Cinco de Mayo! We’re having some hot days over here in the Northern California burbs. 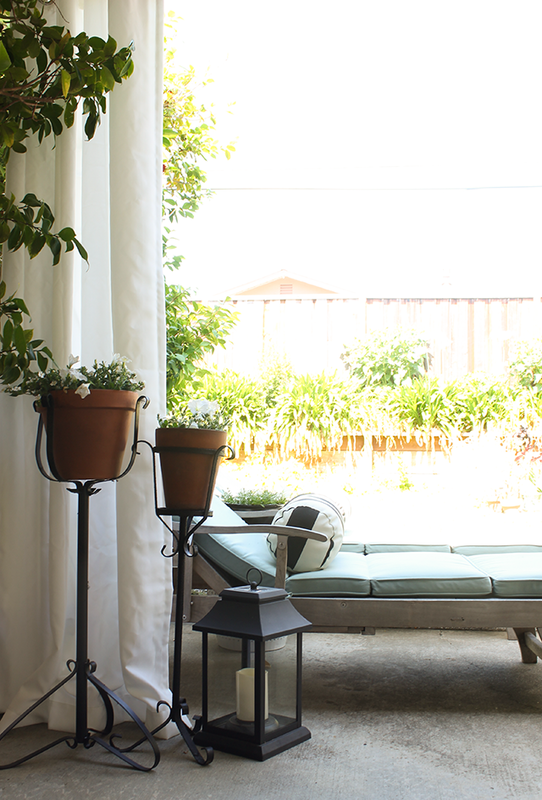 Spring, Summer and Fall are the seasons where it’s possible to extend your living space outdoors. These are the days where I can swap my desk, aka my trusty living room armchair, for a comfy chaise lounge outside instead. It’s pretty amazing, I try not to take it for granted. I feel very, very lucky, believe me! 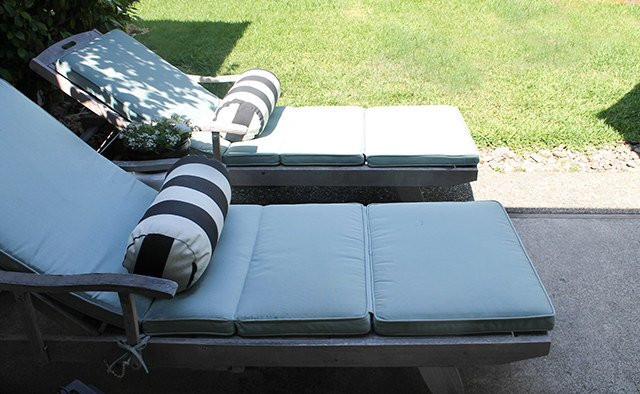 Our backyard has some great spots to sit and relax, but I can’t say the same for our front yard. We have a little porch area with a small patio right outside our front door, but it was wasted space. It’s not very welcoming, I must say. It’s pretty neglected looking with a couple of forgotten potted plants and the skeletal remains of some long ago rock garden. So for the Lowe’s Creative Ideas May challenge we decided to tackle curb appeal. Now, there’s a whole lot I’d like to do to the exterior of our home, but baby-steps right? First things first, we cleaned up the porch area and brought in some furniture and accessories, most of which we already owned. 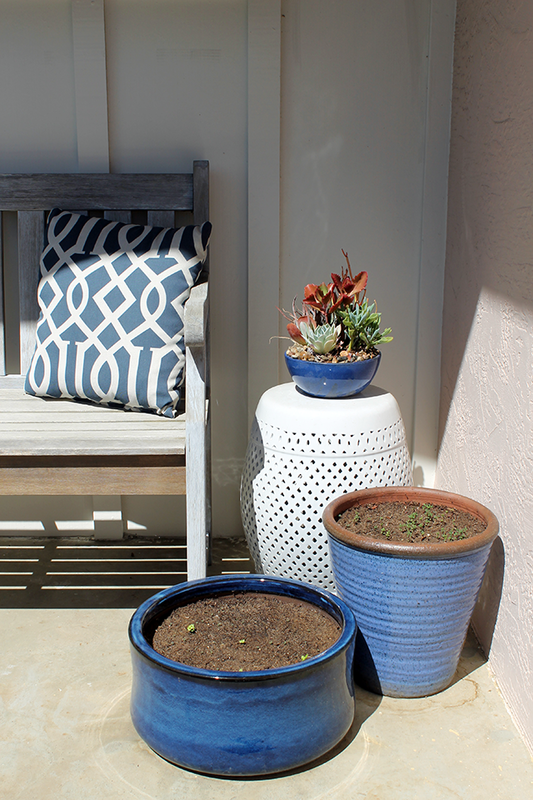 We had all of these succulent pots in the backyard and thought that we’d share the love a little and bring ’em front and center instead. Same with the bench and the blue kwid-esque throw pillows. 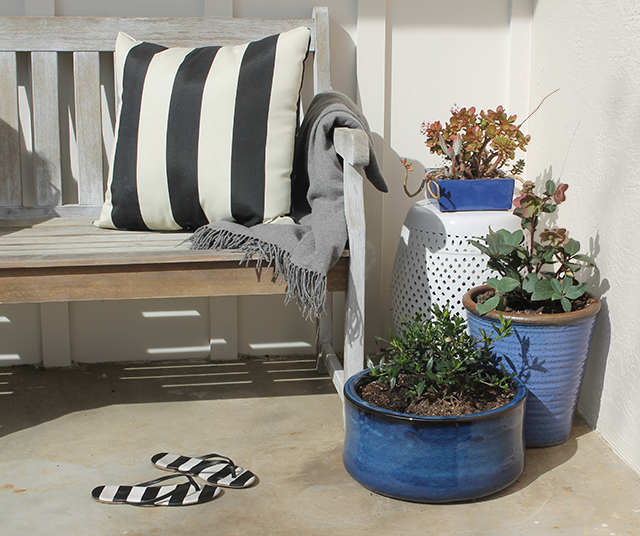 We also bought this great white ceramic stool to use as a small side table. 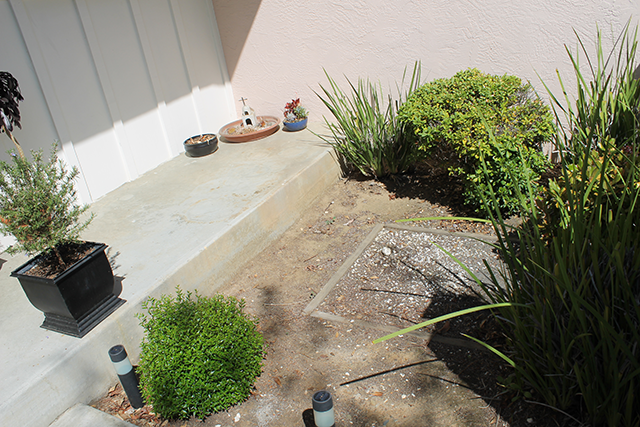 Our little bird bath from the backyard joined the party out front as well. 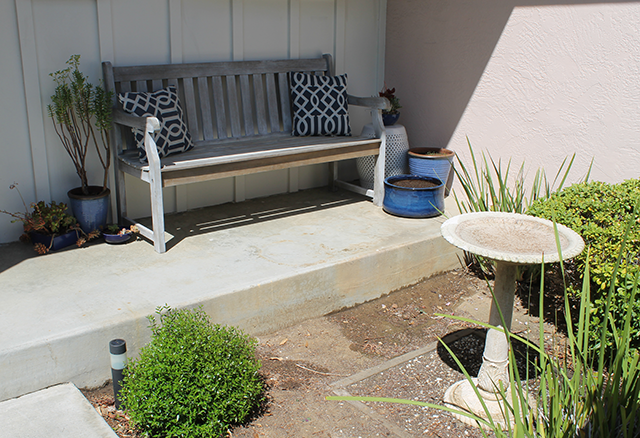 Once we had her placed in the little patio area its was very apparent that, that little space needed some loving care as well. 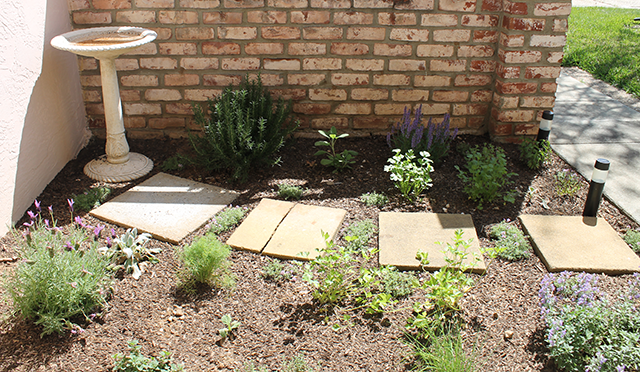 The Mr had a great idea of turning this little area into an herb garden. I jumped on board 100% because who wouldn’t love having easy access to fresh herbs all day, everyday. The kitchen is very close to the front porch; the window overlooking the porch is actually the kitchen window. So all in all, it was a fabulous idea. 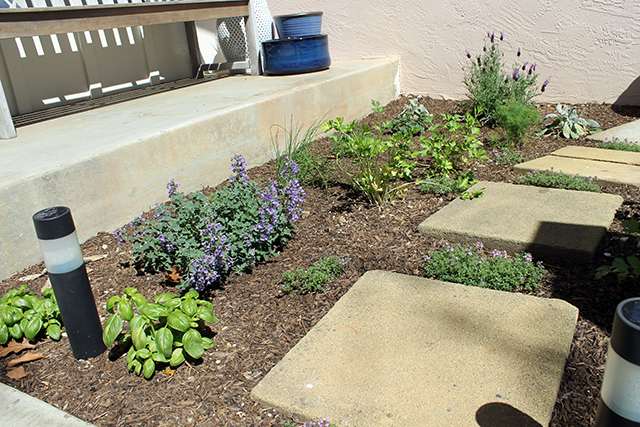 We found a pretty good sized rosemary bush, some Spanish Lavender and a catmint plant with pretty purple flowers. 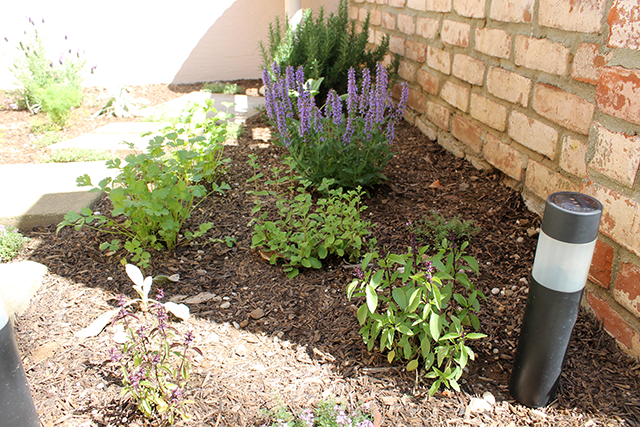 We used three different kinds of basil plants: Green Basil, Thai Basil and Cinnamon Basil. 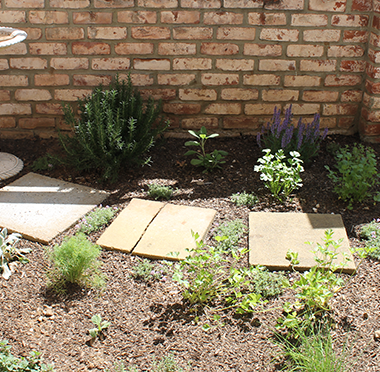 A little Parsley, Sage, Rosemary and Thyme 😉 Ornamental blue sage as well as cooking sage. 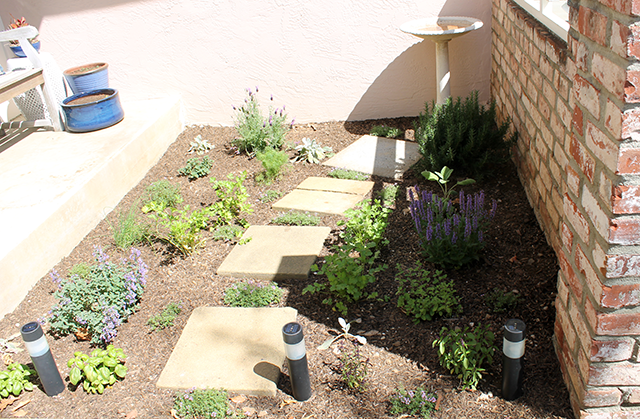 We also used Creeping Thyme in between the stepping stones. 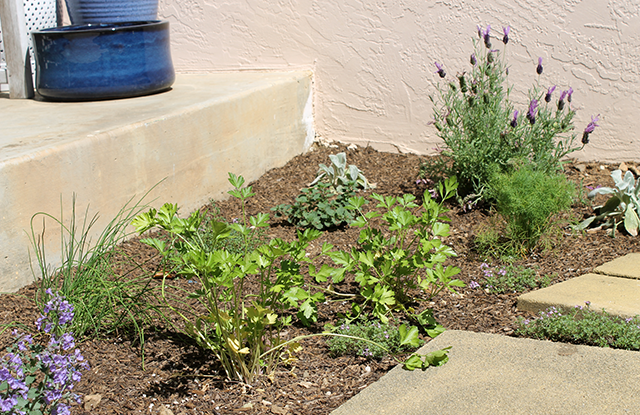 We couldn’t forget the Oregano, Dill, Marjoram and some Chives. Oh and some Lambs Ears and Borage to add some texture and interest. 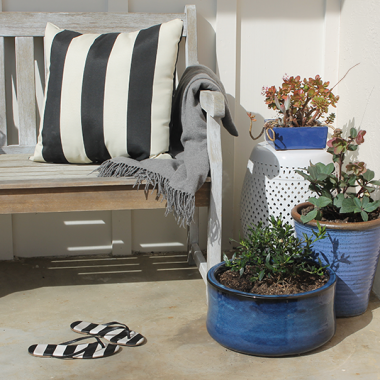 In the blue pots on the porch are basil and thyme that the Mr started from seeds. All in all, a pretty well-rounded herb selection, wouldn’t you say? I love how they all color-coordinate too! 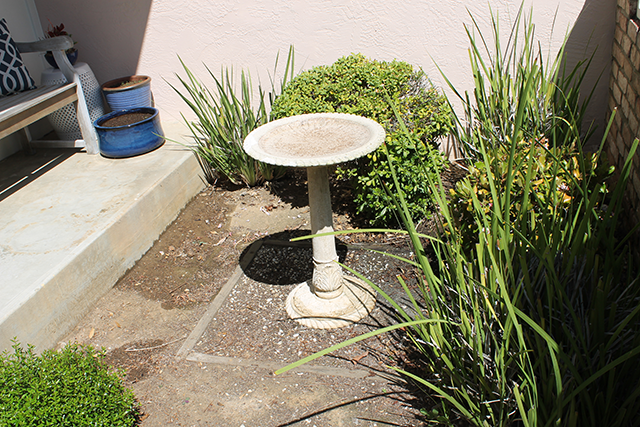 And we’ve already seen a couple of birds using the birdbath. So I’d say it’s pretty successful all around. This sure beats the old view I had from the kitchen window!